Icons are great resource for web designers and developers in the design of all kinds of interfaces, as they allow them to create more visual, attractive and usable environments. We have selected in this post 1k fresh icon sets for website. There are those points in every interactive designer’s career when he becomes fed up with producing the same set of graphics all over again for every website he designs. It could be the social network icons, gallery arrows or any number of his «signature» butterflies for the footer of each of his projects. Similar for interactive developers that have to slice the same GIFs and PNGs each time art-director asks them to. A free icon set, called Style Guides. Perfect for websites with an editorial flair, Style Guides features 14 high-quality icons ranging from 32×32 to 512×512 pixels. Designed by Thomas McGee of WinePress of Words, this set has been exclusively released for Smashing Magazine and its readers. 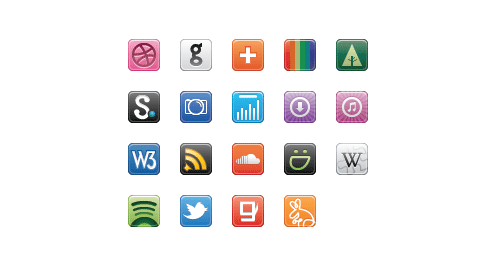 You get 35 colorful social media icons. These are 32px PNG files. No PSD included this time. We tried to include all the popular social media in the set. Plastique Icons is a set of 578 (and growing) web and application icons inspired by advertising clip art of the 1920′s and 1930′s. The set is available in vector format and also includes a CSS/PNG sprite version. To use an icon just add another class: iconX, where X is the icon number. This free icon set, brought to you by Jan Cavan of Dawghouse Design Studio, is inspired by a retro, hand-drawn theme. There are 18 icons in PNG format, sized at 200x200px. The icons include objects such as a chat bubble, a notepad, a martini glass, and more. Here is another icon set that I made nearly two years ago. I always planned to make over 1,000 of these but never got round to it. There are 310 of them and they are designed to be used on web design projects, but some are also suited to be used as system icons. They are all 16 by 16 pixels, in PNG format and free to use in print and web projects. This free set includes 80 icons of the most popular social media networks on the internet. The icons are designed in 32px and 16px vector format. With the vector format, you can scale the icon to any size to fit with your design or use it in high quality print materials. What you will get from the zip package: 16px, 24px, 32px in PNG format and a vector EPS file. Don’t forget to get our Moi icon set to match with this style. The freebie includes both vector (PNG) and pixel perfect (PSD) sources, color and gray versions and different sizes.